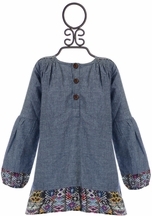 Whats trending in tween clothing, boho and bohemian looks are all the rage. Jak and Peppar will have her covered from head to toe. Mix and match pieces can be paired to make a look that's distinctly her own. 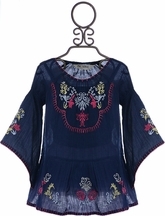 Denim jackets, faux fur Gladiator vests, Gypsy Tunics and Woodstock Maxi dresses for fall with Laney Skirts, jogger pants, peasant tops, lace tops and Pixie Harem Pants for Spring. Bohemian styles are back with a vengeance and my daughter and I are absolutely obsessed! She sees all the styles her favorite celebrities are wearing to music festivals and of course she wants to dress just like them (but a little more modestly, of course!). She loves the gypsy look with long, flowing styles, lots of lace, tie dye, and flowers. Headbands and flower crowns are a constant staple in my little girl�s wardrobe. We were so lucky to find Jak and Peppar to help show off my little girl�s gypsy spirit! 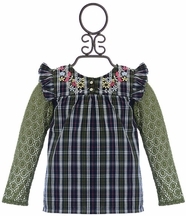 They create the most gorgeous, carefree styled clothing that is both durable and fashionable. Some of my flower child�s favorite pieces are incredibly versatile, and many of the pieces from the brand�s collection coordinate with each other perfectly to create multiple outfits from the same few pieces! The brand uses many vintage inspired patterns to create their timelessly beautiful styles that are perfect for any occasion. The brand has been incredibly revolutionary in their creation of convertible and chic styles. Their maxi skirts are simply adorable! 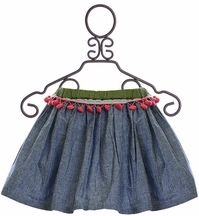 My daughter will often wear the skirt top as a skirt with flowy peasant tops and boots or sandals for casual outings. When she needs to dress it up a little bit more, she will wear flats with the skirt. But when she doesn�t have to look as dressed up, she will wear the piece as a halter top with a cute pair of distressed jeans or simple leggings with a cardigan or jacket. My daughter also loves the convertible maxi skirts. She will wear it as a halter styled sundress for warmer days and when she wants to dress it down, she will wear it as a maxi skirt with a cute top and sandals, boots, or even sneakers. Jak and Peppar is the perfect place to find skirts and shorts that look mature for my tween, but not too mature that she looks like she is dressing too old for her age. Their printed Josefina skirts are my favorite. I love when my daughter find different ways to wear it. The long cut of the skirt looks elegant without looking too fancy for a day at school. 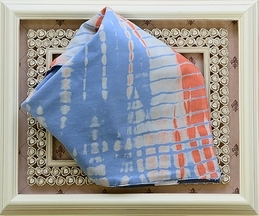 Its asymmetrical handkerchief styled hem looks modish and maintains a femininely casual look. She loves looking like she stepped out of a more innocent and family friendly Coachella, and this skirt helps her to really achieve that look that she wants. Some of her favorite styles are their tunics and dresses. 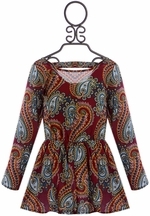 The vintage look is perfect for wearing with leggings or alone and they are cute any time of year. We love the lace accents that give the pieces an extra girly flair. 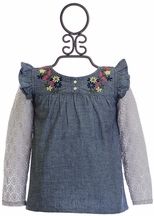 My daughter likes to pair some of her tunics with distressed jeans for a more edgy look. The brand�s rompers are absolutely darling as well. The mix of bohemian prints and lace accents really has a way of conveying a laid-back vibe while looking as beautiful as a spring garden. Festive floral prints in vibrant colors allow her to free her inner gypsy. Even the youngest rebels at heart love fringe, and they definitely has fringe to spare! Some of their most trendy tops feature fringed hems and fringe accents that pair perfectly with any skirt or jeans. My fashionista loves her peasant tops from Jak and Peppar; she wears them all the time! She loves how easily she can pair them with jeans or leggings with a cute pair of sandals or sneakers and a cute cardigan for school. She also likes to pair her Delaney peasant tops with the cute patterned pants and leggings from the designer. Harem styled pants are some of her favorites. They have a little bit of a classier twist on the jogger pants, and my little girl absolutely loves them! She likes how they make her look fashionable without having to wear jeans, and how comfortable they feel. She has mentioned that she loves the way the harem pants make her look like a little artist, and it is simply adorable. 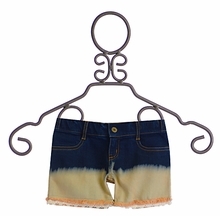 My little hippy loves anything tie dyed, and LaBella Flora often has plenty of tie dyed pieces for her to choose from. She is a huge fan of the Dazed and Confused leggings in all different colors. She can always find a pair of these fun leggings to match with her favorite tees and tunics. She easily wears her leggings to school, for play dates, out to dinner, and even for family outings. Her favorite dresses often match her leggings, and she will sometimes wear the together, especially when the weather gets colder and she finds the leggings more comfortable to wear to school than tights. 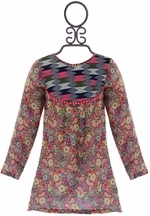 But when she is not wearing tie dye, she looks for earthy, feminine, floral, and lace inspired prints. She loves to wear lace tops with cute printed skirts and pants from the brand. 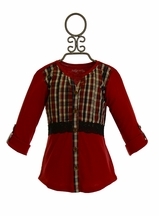 One of her favorite styles is when she wears their tanks and tees under the brand�s lace jackets. The lace jackets look incredibly feminine and give a fresh new life to plain tops. Sometimes, she will even wear the lace jackets with her special occasion dresses to create a polished and chic look while still maintaining her alternative and hipster vibe. When we are looking for school clothes, we turn to local boutiques to find looks that she not only feels comfortable in, but also allow her to express herself and show off her personality. Her bright and peaceful personality really has a way of shining through whenever she wears boho chic styles; not to mention that she loves receiving all the compliments people give her whenever she wears her Jak and Pepper styles! I really feel like I can see every aspect of my daughter�s personality when she wears it. I see her groovy style, her vintage vibe, and her loving and peaceful composure.